If you're a regular reader of this blog, you already know how much I love my Clarisonic Mia. I seriously don't think I could live without it. (Click here for the proof.) So today's giveaway is totally amazing -- because one lucky winner will not only receive the Mia, but the GoClear Clarifying Cleanser as well! This set is exclusive to Sephora -- so this is the only other place you'll find it! 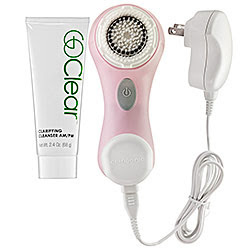 One very lucky winner will receive the Clarisonic Mia with GoClear Clarifying Cleanser, valued at $149. To enter, place your name and email address in the box below. The winner will be selected on Monday, August 9 and notified by email. This giveaway is open to US residents only. Giveaway runs until Sunday, August 8 at midnight. One entry per person, email address and IP address. Multiple entries will be disqualified. This would make an incredibly awesome birthday gift for my DD!!! My skin and I would really LOVE this!